INTRODUCING: The World’s Easiest Webinar Software! Finally… an easy to use webinar software built on top of the popular WordPress platform as a simple to setup WordPress plugin. After a quick 30 second install, you’ll have one of the most complete webinar systems to create an unlimited number of webinars. Works with almost every theme. 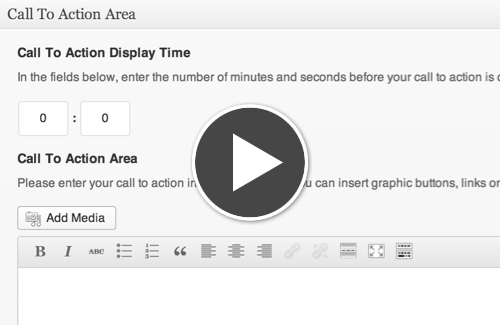 BRAND NEW: WordPress Plugin Creates Unlimited High Impact Professional Webinars Using WordPress In 5 Minutes Or Less! Let’s face it, everyone is either doing webinars or attending them. Which person are you? If you’re NOT currently doing webinars in your business then you’re leaving money on the table. Your customers are already attending webinars… shouldn’t they be attending your webinars? The reality is that webinars are one of the most powerful marketing tools you could ever use in your business. But… there’s some inherent problems with existing webinar systems which you need to understand. First… you have the option of doing a LIVE webinar. The problem lies in the fact you actually have to be there. Don’t get me wrong live webinars are great in certain circumstances. But, like I said… the very nature of them is you have to do them live. Second… Most webinar software is complicated. It’s true. I’ve tried almost every webinar software there is and even being a software developer myself, even I couldn’t figure them out. If I couldn’t figure it out, then how in the world can other people. This led me to a very important idea. What If I Created and Easy To Use Webinar Software Built Upon The Most Popular Website Software In The World… WordPress? The idea was simple… why not create a webinar software built upon WordPress with all the features of the most popular software at an affordable price. Seriously, is that too much to ask? I didn’t think so and that’s exactly what I did. But it gets even better. Instead of creating a theme I decided that I wanted it to work with most any WordPress theme, so I developed it as a plugin. This means you are not theme dependent. You can use any theme you want. 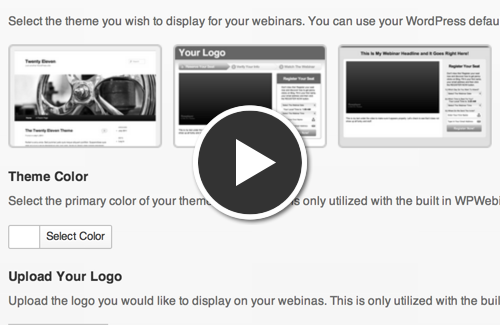 If you change themes, it doesn’t effect your webinars. Also, I’ve even created several pre-built themes into the plugin itself. Plus… many more great fetures! Works With Literally Any Autoresponder System! 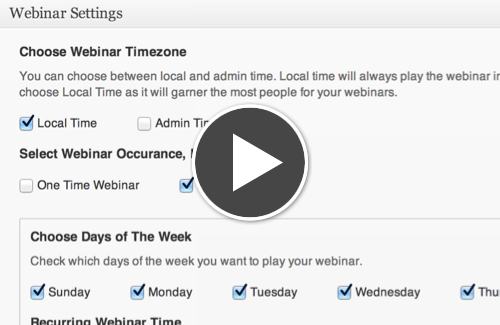 Look At All The Incredible Features Included With WPWebinar! WPWebinar is one of the only systems which allows you to to utilize your own theme to keep consistency in your marketing efforts. Your website and your webinars will be consistent. 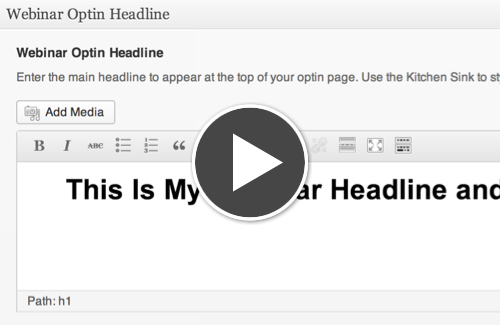 Every aspect of WPWebinar is fully customizable starting with the optin page. 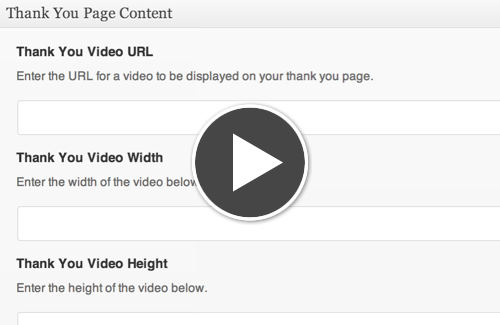 You can specify size your video with the built-in video player to make it seamless in your design. 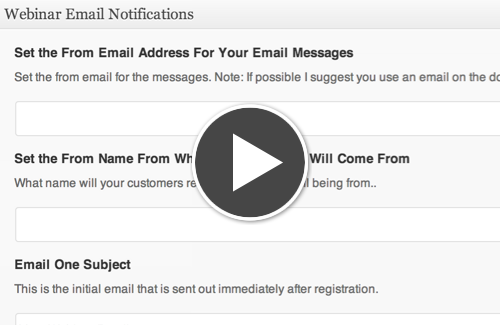 Seamlessly Use ANY Autoresponder System You Want With WPWebinar! 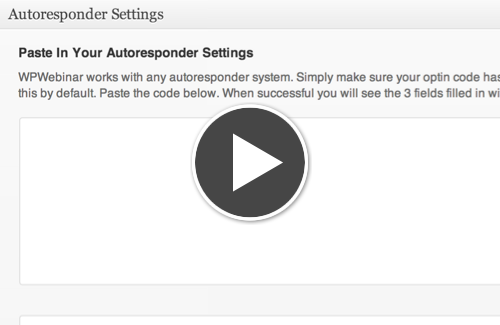 There’s no need to worry about which autoresponders integrate with WPWebinar. We integrate with every single autoresponder on the market with our unique parsing system. All you have to do is simply highlight, copy and paste your autoresponder code into WPWebinar. The system will do the rest of the work. The output is a fully custom webinar optin. The thank you pages of your webinars are of vital importance and we realize that. So we’ve created WPWebinar to alllow full customization of all aspects of the thank you page. In addition, this one page can instantly make your webinars go viral with full social media integration. WPWebinar integrates with FaceBook, Google, LinkedIn and Twitter. Next, select the time and days of yoru webinar. You can choose one day a week or multiple times per day or week, the choice is yours. It’s all a quick and easy setup. The Question Is… How Much Does It Cost To Get Your Hands On All The Great Features We Have Included With WPWebinar? Many of the other webinar systems are loaded with features which are unnecessary and their prices also reflect this. What we’ve done with WPWebinar is give you the features you need and want, but more importantly at a price point which makes it affordable. If you’ve watched all the videos on this page, you already know the amazing features we’ve created with WPWebinar. In addtion to the features, we’ve also built it on top of WordPress to make it drop dead simple. Let’s Get To The Point… How Much Is It? First WPWebinar is a ONE-TIME purchase which also includes LIFETIME UPDATES. Which means as we continue to improve WPWebinar, you’ll automatically get access to all the new version we continue to make. This ensures you’re always using the latest advancements in webinars to build your business. Get WPWebinar Today For As Low As $197! YES! I Want to start utilizing WPWebinar, the easiest webinar software in the world, to skyrocket my online business. I UNDERSTAND… I will be able to create UNLIMITED WEBINARS. I UNDERSTAND… I will be able to build a HUGE OPTIN LIST. I UNDERSTAND… I will be able to create AUTOMATIC INCOME. With our single site license you get all the features of WPWebinar with the ability to create unlimited webinars on a single domain. This version will place a small branding message at the bottom of each page stating “Powered By WPWebinar”. This message can be customized with your affiliate ID. With our multisite license you get all the features of WPWebinar with the ability to create unlimited webinars not only on one domain, but on an UNLIMITED number of domains you own. Note: This cannot be used on customer domains. You must own the domain in use..
©2019 WPWebinar - Armand Morin Network. All Rights Reserved.